There are so many marijuana industry events these days it’s nearly impossible to keep track of them all. I remember even just a couple of years ago there weren’t that many. Not all marijuana industry events are created equal. Trust me, i have been to a lot of them. Marijuana industry events range from stellar to events so lacking in knowledge and organization that I usually end up on the side dock with the banquet staff using an apple as a smoking device. 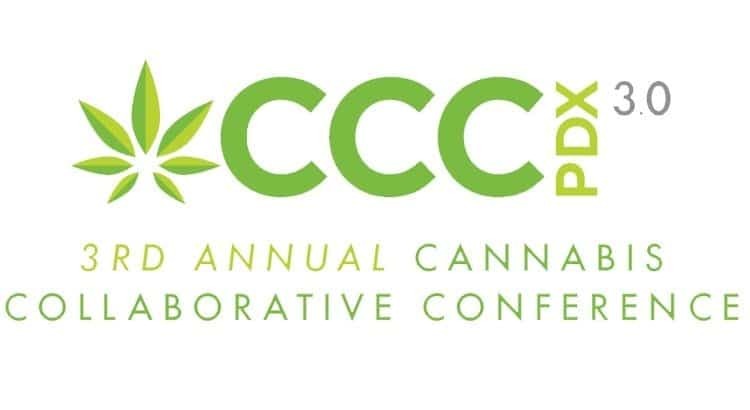 The Cannabis Collaborative Conference is back in Portland for its third installment. The conference is a Mary Lou Burton and crew event, and their events are always outstanding. In addition to the last two Cannabis Collaborative Conferences, Mary Lou and her team also organized the Oregon Cannabis Grower’s Fair which was an inspiring national story, and definitely one of the highlights of 2016 for me personally, as I traveled to the Oregon State Fairgrounds and saw history being made with live cannabis plants on display. While other states are only showing off large pumpkins (no offense pumpkin growers in other states), Oregon had dozens of cannabis plants with judges rating them like any other agricultural crop. It was one of the proudest Oregonian moments of my lifetime (fourth generation Oregonian!). The second Cannabis Collaborative Conference made huge headlines as well, with Cliff Robinsonannouncing his entrance into the cannabis space and becoming more vocal of his cannabis advocacy. I obviously have never made it a secret how huge of a fan of Cliff’s I am, and I know I’m not alone, and he’s a hell of an ambassador for sports cannabis and a freedom fighter. Cliff has been hit by cannabis prohibition more than many people realize, and his passionate advocacy is sincere and has changed a lot of minds. Believe me, I’ve seen it first hand. When it was announced that Cliff was speaking at the conference, it was covered by ESPN, The Washington Post, USA Today, and many other major outlets. And those were just the American outlets that covered it. It was crazy. I have literally been at other events and heard people comparing the event they were at to the Cannabis Collaborative Conference (CCC), and talking about how it wasn’t as good as CCC (true story). Mary Lou and her team really do an outstanding job. The Cannabis Collaborative Conference is much more than just a conference where people fumble about wondering how they accumulated so many stickers and SWAG bags. The list of speakers is incredible, with some truly talented, knowledgeable people on the roster. Literally every facet of the industry is covered in some way by the speakers that are scheduled to present. I don’t know that they have announced the keynote speaker yet, but I have seen it, and it’s fantastic (will post an update when I can confirm that it’s OK to share). Becoming a sponsor and/or exhibitor is a great idea to help boost your brand, as attendance is going to be high and the cannabis industry is becoming more and more crowded every day. Becoming a sponsor and/or exhibitor is a great way to get the word out, which is incredibly important these days. The event is particularly timely for those looking for an investor. I get hit up all the time by people looking for help getting their idea(s) off the ground, and this event is a great place to network for that purpose. There is a pre-conference Investor Summit, there will be a ‘Match-making lounge’ to try to match up the right entrepreneur with the right investor, as well as a “Pitch Portal” which looks really fantastic. For the amount of speakers involved, the networking opportunities, and the quality of the event, the event is a great price. I really like that there is a one day option for those that may not be able to make both days. If you are serious about the cannabis industry, and you are serious about networking and learning, this event is a great buy. Compare it to other reputable events that are out there and you will see what I’m talking about. More info to come. Stay up to date by following the Cannabis Collaborative Conference on Twitter, Facebook, and Instagram.